A lot of cooks find that rice vinegar has a milder flavor than either cider vinegar or distilled vinegar. This shouldn’t be surprising, because the rice vinegar sold in stores contains less of the main component of all vinegar, acetic acid. Formulated for making sushi, Marukan rice vinegar has an acetic acid level of 4.3 percent. Other Japanese-style rice vinegars have acid levels as low as 4.0 percent. * In the United States, distilled and cider vinegars are always sold at 5.0 percent acidity. Wine vinegar has acid levels as high as 7.0. The milder flavor of rice vinegar may result not only from its lower acidity but also from its balanced complexity. This complexity may stem from its biologically complicated manufacture: Aspergillus oryzae, a kind of mold, is added to steamed rice and water to convert the starch in the rice to sugar. As in wine and beer making, sugar-loving yeast in the genus Saccharomyces converts the sugar to alcohol. The product is sake, but this sake isn’t for drinking. Over a period of thirty days, in the traditional method to which Marukan adheres, Acetobacter bacteria turn the sake to vinegar. Through this carefully controlled process, rice vinegar ends up containing not only acetic acid but also amino acids, citric acid, and other minor components. Tom Reynolds knew that USDA pickling recipes, and other pickling recipes written to USDA standards, called for 5.0-percent vinegar. He wondered if Marukan should produce 5.0-percent rice vinegar specifically for home canners. To explore this possibility, he sent sample gallons of 5.0-percent rice vinegar to me and a few other people who write about pickling. My package arrived in February, when I had little garden produce to work with. I decided to make canned pickled carrots, one jar each with distilled vinegar, 5.0-percent white wine vinegar (Four Monks brand), and 5.0-percent Marukan rice vinegar. In my experiments for The Joy of Pickling I had used carrots only in refrigerator and freezer pickles. I’d been so repelled by the USDA recipe for canned pickle carrots, which calls for one part water to two parts sugar and five and a half parts distilled vinegar, that I hadn’t even tried it. But if rice vinegar really tastes so mild, I now figured, perhaps it could make a tolerable pickle with such a slight dilution as the USDA allowed. And I could cut the shocking amount of sugar in the USDA recipe; as Extension agents explain, the purpose of the sugar in such recipes isn’t to ensure safety but to balance the sharpness of the vinegar. I made a few other alternations to the USDA recipe. The half-inch carrot chunks called for looked silly to me–too small for finger food and too big for relish–so I sliced the carrots ¼ inch thick. The mustard and celery seed in the recipe might overwhelm the flavor of the vinegar, so I decided to use just a little ginger and hot pepper instead. Boiling the pickling liquid for three minutes before adding the carrots seemed pointless, so I didn’t do it. In a small saucepan, combine the vinegar, water, sugar, and salt. Bring the liquid to a boil, and immediately add the carrots. Simmer them for 5 minutes, uncovered. While the carrots simmer, put the pepper flakes and ginger into a clean pint mason jar. Add the carrots to the jar, leaving ½ inch headspace. Pour the hot liquid over, maintaining the ½ inch headspace. Screw on a two-piece cap, and process the jar for 15 minutes in a boiling-water bath. A couple of weeks later, during a family party, I put some of the carrots into bowls for a blind tasting. Here’s what my tasters concluded: The distilled vinegar seemed to heighten both the sweetness of the sugar and the heat of the pepper and ginger. The wine vinegar contributed a little fruitiness and covered up some of the carrot flavor. The rice vinegar tasted most mild. With a slightly earthy note, it let the flavor of the carrots shine through. The pickles in all three jars were tasty, but the carrots in rice vinegar were just a bit more to everyone’s liking. I reported to Tom that a motley assortment of my relatives had joined his rice-vinegar fan club. Now, when would that 5.0-percent rice vinegar be available in stores? Probably not any time soon, Tom said; assuming that stores would want to carry it, the vinegar couldn’t be economically priced at less than ten dollars per gallon. If it were sold by mail order, the price might be as high as twenty dollars per gallon. As Tom had considered, though, nearly all the USDA pickle recipes call for diluting 5.0-percent vinegar with water. So, why couldn’t you convert the quantities to use 4.3-percent vinegar? This was a matter of simple arithmetic, I said. For those with rusty sixth-grade math skills, Marukan could provide recipes for canned pickles using 4.3-percent rice vinegar. ● Multiply the volume of 5-percent vinegar in the original recipe by 1.16 (because 5.0 divided by 4.3 equals 1.1627906). The result is the volume of 4.3-percent vinegar in your revised recipe. ● Subtract the volume of 5-percent vinegar in the original recipe from the volume of 4.3-percent vinegar in your revised recipe. Reduce the volume of water in the revised recipe by this amount. Here’s the pickled-carrot recipe revised for a bigger batch using 4.3-percent vinegar. Because I had liquid left over in the single-jar recipe, I increased the liquid volume four times but the weight of the carrots five times, for a yield of five pints. If you like a lot of ginger and chile, increase their amounts. Or use different spices, if you prefer. And consider cutting the carrots into sticks or diagonal pieces rather than rounds. In a small saucepan, combine the vinegar, water, sugar, and salt. Bring the liquid to a boil, and immediately add the carrots. Simmer them for 5 minutes, uncovered. While the carrots simmer, put the pepper flakes and ginger into five clean pint mason jars. Add the carrots to the jars, leaving ½ inch headspace. Pour the hot liquid over, maintaining the ½ inch headspace. Screw on two-piece caps, and process the jars for 15 minutes in a boiling-water bath. A final note: When you’re buying rice vinegar for pickling, make sure that it’s unseasoned. Rice vinegar is often sold with sugar and salt added, in the proportions that the manufacturer considers appropriate for sushi rice. In some supermarkets the only rice vinegar available is the seasoned kind. Even if you’re buying rice vinegar for sushi, you may prefer to season it to suit your own taste. *Beware: Some “Japanese rice vinegar” is actually made in China. This labeling isn’t entirely dishonest; Chinese rice vinegar is traditionally red or black, not clear. Marukan has been making its rice vinegar in Japan since 1649. For the American market, the company has made vinegar in California, from U.S. grown rice, since 1975. This entry was posted in Pickles, Preserving science and tagged canning, carrots, food preservation, pickles, recipe, rice vinegar, USDA. Bookmark the permalink. I love rice vinegar! I often wondered if it could be used for canning, since as you pointed out, most recipes call for diluting it with (assuming pH 7.0) water. Thanks for the recipe(s), I’m going to have to try this when we have home-grown carrots ready. Well done, Linda. I appreciate the thoroughness of your investigation. I often have a batch of refrigerator pickles made with rice vinegar on hand. Now I can follow the calculation to can them as well! I’ve never tried Rice Vin. I’ll look for it in my market. Sounds good. Wonderful breakdown, and thanks for the hacks on the carrot recipe. We’d been put off too by the amounts of sugar in some of the USDA and Ball recipe books. Great post Linda! Love how thorough you are, I adore your book and appreciate your recipe here. I too am a fan of Rice Vinegar. Thank you thank you thank you for this post! I love Asian flavors and I was wondering the same thing about using 4.3% rice vinegar just with less water, but I wasn’t sure if acidity worked with sixth grade math (since pH is logarithmic, for instance). 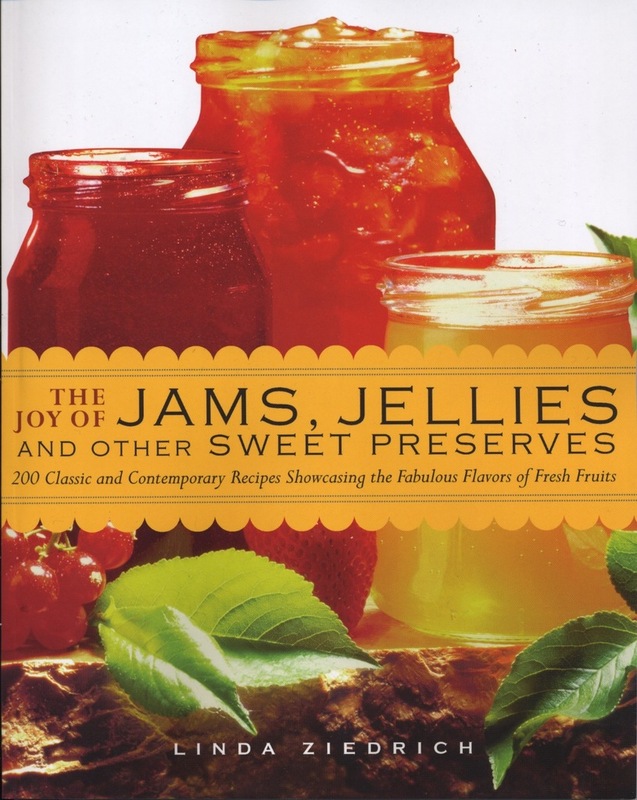 I just picked up your book from the library and I love it – if you are interested, check out my Asian variation on your Gingery Watermelon Rind Pickle. Wow. I just found this post today! You are amazing, Linda. I join you in being repelled by USDA-approved recipes for pickled carrots. Interesting that all that sugar is there to help one tolerate the vinegar! And then I swooned when you did that math. I’m spending today working on class notes for the live-cultured pickling class I’m teaching next week, and please know that I always direct people to your book. 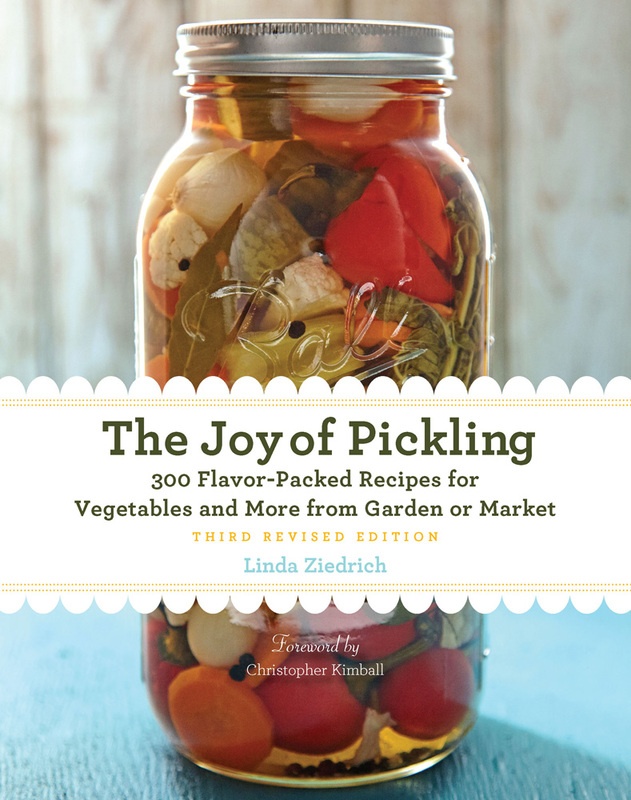 I consider Joy of Pickling to be essential reading for anyone interested in any kind of pickling — including fermentation. Other books can be inspiring sometimes, but just yours is essential. No, Mona, I haven’t tested the pH of carrot pickles made with the 4.3 percent vinegar. But I think you can tell from the ingredients list that the pickles would be quite sour. That makes 4 pints, calls for 3.5 lbs of carrots (says it will be 2.75 lb after peeling), 5.5C of 5% vinegar and 1C of water (plus 2C of sugar, salt, mustard and celery seed). Taking the 5.5C of vinegar and multiplying by 1.1628 to use 4.3% instead of 5%, I get 6.395C of vinegar. Subtracting that from the 6.5C of liquid in the recipe, that leaves 0.837 oz to be made up by the water. Doesn’t seem worth measuring – might as well use straight 4.3% vinegar. I’m wondering if this would be true for all recipes (certainly ones that use more than 85% vinegar solution, based on 5% vinegar)? Since 4.3/5=86%? The carrot recipe is a little unusual in its high quantity of vinegar in relation to water. But you’re right–there’s not a big difference between 4.3 and 5. The difference between 4 and 5 is a little more significant. I don’t suggest compensating by increasing the liquid in each jar; that would seem wasteful to me. If you’re making a pickle that’s supposed to be very tart, it makes sense to buy vinegar with 5 percent acid. Hi Linda – I know this was posted a while ago, but thanks so much. It’s exactly what I was thinking about. We love a quick fridge pickle using rice vinegar and Korean moo radishes, and I’ve been trying to figure out if we could can them as well. I found this recipe for sweet pickled daikon using rice vinegar on another site and was just wondering if you think it looks safe? The ratio of vinegar to water seems ok, but I just wanted to check. The recipe calls for ten minutes in a boiling water bath and then says they’re good for a year. Sarah, there are no USDA guidelines for canning pickled daikon or other radishes, but I see no reason that the recipe shouldn’t be safe. If you’re worried, you might increase the processing time to 15 minutes, which is the USDA time for pickled baby carrots (at less than 1,000 feet). But since the carrots are to be left whole and the radish sliced thin, 10 minutes is probably sufficient for the radish. Thanks so much. Just finished taking them out of the boiling water bath and hoping for success. Quick question, when I got all of the jars to the counter they were all bubbling/fizzing inside with the tiny bubbles coming to the surface inside the jars. Is this normal? None of them leaked during the canning process, and I made sure to keep the rings only fingertip tight (I think, at least). Yes, Sarah, the bubbling is normal, but sometimes leakage also occurs after jars are removed from a canner, and that leakage can keep lids from sealing as well as cause a loss of liquid. To avoid this risk, I turn off the heat, take off the canner lid, and leave the jars immersed in water for 5 minutes before removing them. Hi Linda, so glad to find this article! My husband canned 12 quarts of pickled beets last fall and used no recipe, just 100% pure Maruchan Rice Vinegar. He forgot they should be refrigerated, since the vinegar was not 5%, and stored them in our Puget Sound mudroom (average temps 40-60 degrees or so). Upon discovery of the neglected and forlorn jars of beets, he ate some. Ever since he’s been in mortal fear of botulism. I’ve been using the beets to make hummus (delicious! pink!) and no one has died yet from eating my hummus. But he still refuses. Says we must wait 11 days to ensure no symptoms, etc. With your reasoning about increasing vinegar or reducing water to ensure enough acidity, can you confirm my sense that with no water, the acidity was more than enough to kill botulism bugs? Christine, let’s say your husband started with the USDA pickled-beet recipe, which calls for 4 cups 5-percent vinegar to 2 cup water. To substitute the rice vinegar, he would multiply 4 by 1.16, to get 4.64. So his revised recipe would require 4 2/3 cups rice vinegar. To find out how much he should reduce the quantity of water in the recipe, he would subtract 4 from 4.64. The difference is .64, or about 2/3 cup. He would then subtract 2/3 from 2, the quantity of water called for in the recipe, and get 4 2/3. So his new proportions are 4 2/3 cups rice vinegar to 1 1/3 cups water. If he instead decides to use 6 cups rice vinegar and add no water at all, his pickled beets turn out much more acidic than the USDA calls for. By the way, whether you store your processed, sealed jars in a warm or cool room will affect the rate of change in texture and flavor of your pickles but not your botulism risk. You simply cannot get botulism from well-soured pickles. Hi, your info on rice vinegar is exactly what I was looking for! I would appreciate your comments please on something I have been doing–making quick/refrigerator pickled serrano chiles. I put double thick simple syrup with kosher salt, rice vinegar and sliced serrano chiles to taste. The liquid makes an amazing hot sauce, plus you have the super tasty chiles. Sounds good to me, Bernadette!